Kensington Gardens Square in Bayswater is a mid-C19th town square of stucco-fronted houses, originally built as family houses for members of the then-emerging professional classes and now flats and hotels. The communal garden continues to be for the private use of residents of the surrounding houses, and is roughly triangular, divided east west by a terrace of houses. The railings were removed in WWII but some have been replaced with replica wrought-iron railings as part of the upgrading of the gardens. 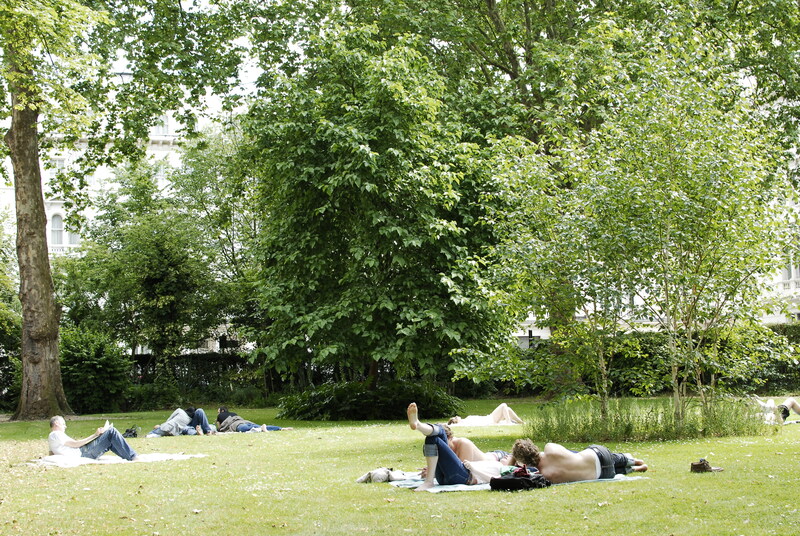 The gardens are largely lawn, with shrubs and a perimeter path; among the trees are a number of fine London planes. Kensington Gardens Square is a town square of 5 and 6-storey stucco-fronted houses originally built as family houses for members of the then-emerging professional classes and now flats and hotels. The popularity of stucco was influenced by John Nash's Regent's Park estate developed for the Crown Estate. Development of Bayswater, until 1807 a small hamlet known for its tea gardens and water supply, took place from the early C19th onwards and was undertaken by a number of speculative builders; Leinster, Princes and Kensington Gardens Squares were part of a scheme by speculator George Wyatt, which he commenced in 1856. Each of these garden squares provided communal gardens for the surrounding houses and Leinster Square was the first to completed, in 1864. Edward Weller's Map of London of 1868 shows all three squares with gardens laid out. By the mid 1860s Bayswater was entirely built over and towards the end of the century its social character had changed with a greater number of commercial premises and hotels, the latter to serve customers of the railway. When William Whiteley expanded his enterprise south of Westbourne Grove to a site adjacent to the Municipal Baths, he established dormitories for his staff in Queen's Road and dining rooms in Kensington Gardens Square; Whiteley's new building was completed in 1911. The communal garden for Kensington Gardens Square is roughly triangular in plan, divided east west by a terrace. The gardens once had a central feature shown on the 1872 OS map, no longer in evidence. In 1928, the 2 enclosures are described as follows: one was 'very small, flanked on all sides by roads', the other, larger garden was 'attractively laid out as lawns, with some well grown trees' overlooked by hotels and private houses. At that time the garden was owned by a Col. C W Sofer Whitburn and Mrs M F Christie, but was maintained and controlled by a Committee of residents of the surrounding properties who had the right to use the garden. The railings were removed in WWII and until recently the garden was bounded by wire mesh fencing. Gates to both gardens, 3 in total, and a short stretch of railing on either side were replaced as close in design as possible to the originals in 2002, the remainder yet to be replaced. This was undertaken as part of the upgrading of the gardens, which by the mid 1990s had become somewhat neglected, particularly in the northern part. The garden today is largely grassed with trees, shrubs, and a perimeter gravel path. Among the trees are three notable London planes on the boundary to the north with other mature specimens in the southern part.